Dental implants are arguably one of the most historically significant developments in dentistry. Initially, when the current screw-shaped implants embedded in bone were introduced, surgical specialists were the main providers of this service and a second clinician typically restored the implant. At first, there was little joint ownership of the implant — but that scenario has changed. Today, if two providers are involved, there is generally good communication between the surgeon and restorative dentist. Surgical challenges frequently involve loss of tissue support (bone and soft tissue) that does not always allow implants to be placed in an ideal position for the prosthetic superstructure. In addition, as treatments have become increasingly complex, the importance of information sharing and collaboration between surgeons and restorative doctors has increased proportionately. Digital technology greatly aids this communication, in the initial stages of treatment by allowing three-dimensional (3D) information that details the availability of bone and ideal position of the restoration via cone beam computed tomography (CBCT) with a radiographic guide that can later be converted to a surgical guide. Recent advances in computer aided design and computer aided manufacturing (CAD/CAM) allow the fabrication of highly accurate surgical guides that facilitate precise implant positioning. FIGURE 1. Available from various companies, special implant software — such as this Anatomage Invivo example — aids clinicians in virtual treatment planning. More specifically, the use of CAD technology can be utilized in implant surgery by taking CBCT images and using specialized software to virtually place implants. In turn, the resulting imaging can be shared between the surgeon, restorative dentist and laboratory (Figure 1). This serves as an excellent communication tool and helps reduce potential discrepancies between the desired and actual implant positioning. The CBCT will show the surgeon where the crown will be from the radiographic guide, the restorative doctor can see where the surgeon plans to place the implant (based on availability of bone), and the laboratory can provide valuable input to the surgeon and restorative doctor. If the position of the implant is acceptable to all parties, the radiographic template can be converted into a manually fabricated surgical guide, or modifications can be made. It is also possible to place virtual restorations on the implant if a radiographic template was not made. In addition, clinicians can superimpose the CBCT on the patient’s 3D scans or stone models (Figures 2A and 2B), with our without wax-ups. FIGURES 2A and 2B. Stone model without wax-up (A), and with wax-up (B) scanned and superimposed on a cone beam computed tomogram virtual treatment plan for implant #11. Besides virtual treatment planning, providers can implement all-digital workflows — from scanned impressions to surgical placement through a 3D-image-guided template, and, ultimately, milling of the restoration.1 As might be expected, approaches to the fabrication of surgical guides have evolved over the last 15 years. At first, the guides were designed to be placed on bone, then on soft tissue and later on teeth (Figures 3A and 3B). This technology requires great accuracy in order to yield predictable outcomes, and this article will address this issue in detail. FIGURES 3A and 3B. These images illustrate a soft tissue-borne guide with pin fixation (A), and a tooth-borne guide (B). Placing 3D-image-guided implants entails two levels of “completeness,” which has led to the distinction between fully guided and partially guided. Assuming there is adequate keratinized gingiva, the fully guided approach allows for flapless surgery, full drilling with vertical control of the drills through the guide, and placement of the implant through the guide with a vertical stop (Figures 4A and 4B). 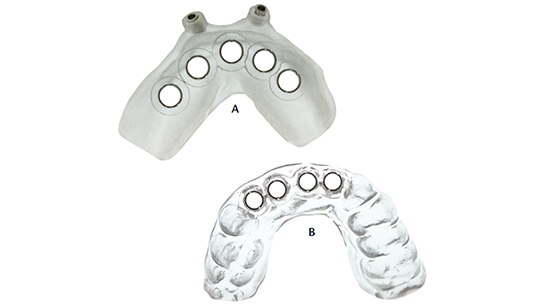 At this time, however, not all implant products allow the use of the fully guided approach. In a partially guided technique, there may be vertical control on some of the drills, but the implant is not placed through the guide with vertical control. This typically means that it is not flapless surgery. These guides are still useful, albeit slower and possibly not as accurate as fully guided systems — although there may be insufficient data to support that statement. FIGURES 4A and 4B. Three-dimensional-image-guided surgery with vertical control of drilling (A) and implant placement (B). Like all developing technologies, CBCT-image-guided implant surgery has evolved through several generations of the imaging and fabrication processes. The first guides were designed to be placed on bone and fabricated using stereolithography (3D) printing technology. An early comprehensive report on this approach by van Steenberghe et al2 evaluated edentulous patients receiving multiple implants with an immediate loading protocol. Conventional implant surgery has almost always included exposing the implant site with an incision and flap. Yet, with the additional 3D information about the architecture of the underlying bone, it has been one of the alluring aspects of guided surgery to avoid an incision and flap. This means the guide is placed and held on soft tissue, osteotomies are performed and implants placed with a guide that is based on the CBCT plan. One of the first studies of flapless image-guided surgery was by Merli et al,3 whose team avoided flap and bone exposure by using a computer-guided approach in the edentulous maxilla in a pilot prospective case series involving 13 patients receiving 89 implants. 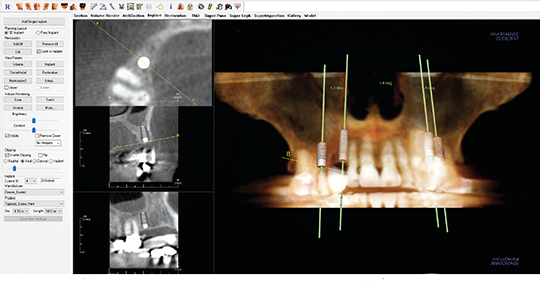 The researchers used Procera software and a NobelGuide approach to place the implants in atrophic fully edentulous patients. The team noted a 94.4% implant success rate, which, for the atrophic edentulous maxilla, is similar to nonguided approaches. While the authors did not report data regarding accuracy, they commented that a learning curve was evident, in that many of the failures occurred in the early cases. More recent studies reported similar or slightly lower success rates with the same approach.4–6 In 2008, a paper on a flapless technique with NobelGuide was published by Komiyama et al;6 in this study, 29 edentulous patients received 176 implants in an immediately loaded approach. The team noted an 89% implant success rate, but a higher-than-normal incidence of surgical and technical complications. They concluded this methodology should be considered as being in the exploratory phase of development. A long-term survival study by Orentlicher et al4 detailed a 7-year retrospective analysis of cumulative survival rate of implants placed using the fully guided approach. They analyzed 796 implants placed using CBCT-guided surgery in 177 patients. The cumulative survival rate was 96.9% and they reported no reduction in survival when immediately loading the implants. Similar survival results were noted by Vasak et al;5 in reviewing 163 implants in 30 patients, the team reported a cumulative survival rate of 98.8%. In cases involving partially edentulous patients, though it would make sense to use the remaining teeth for placement and anchorage of the guide, achieving a good representation of the teeth in the CBCT may prove difficult. In 2008 and 2009, companies began experimenting with 3D scanning of stone models (and, later, direct intraoral scans). When superimposed in the CBCT (Figures 2A and 2B), these scans overcame the problem of inaccurate representation of the teeth — especially when metal is present. It is important to differentiate outcomes based on the fabrication process and guide seating method used. In 2009, Ozan et al7 compared tooth-, bone- and soft-tissue-supported guides, and reported on accuracy and outcomes based on seating methods. This was one of the first studies to compare the accuracy between the planned and actual position of the implant using these various approaches to seating the surgical guide. The study demonstrated the greatest accuracy when using tooth-supported guides. The increased accuracy of guides placed on teeth was confirmed by Arisan et al8 in a study of 3D-printed guides placed on teeth, bone or soft tissue. They found tooth-borne guides to be significantly more accurate than either bone- or soft-tissue-supported guides. The researchers also noted that if soft-tissue-borne guides are used, accuracy could be improved by fixating the guide with screws. This has subsequently become even clearer. A recent systematic review of computer technology applications in surgical implant dentistry by Tahmaseb et al9 found 14 survival and 24 accuracy studies that met the criteria for inclusion. The survival rates and accuracies reported were similar to earlier studies. Behneke et al10 studied factors that affected transfer accuracy and found that flapped or flapless surgery did not significantly influence accuracy. Improved accuracy was noted, however, when the implant was placed fully guided (i.e., all drill steps and implant placement occur through the guide), as compared to freehand placement of the implant, with all drilling done guided, and when the final drill sequence was freehand and only the first drill(s) guided. These studies illustrate additional variables that, as of yet, are not well documented in the literature: namely, whether the guide was used for the initial (pilot) drill or subsequent drills, and if the implant was placed through the guide with a vertical stop or by freehand. Further studies are needed to fully understand the impact of these variables. The increasing quality and availability of personal 3D printers makes in-office printing an attractive alternative to buying guides from laboratories (Figure 5). A possible downside with 3D printing technology is that, at present, these are resin-only guides. By comparison, other guides may contain metal sleeves (Figures 3A and 3B, and Figures 4A and 4B) that allow greater stability for drill guidance, for all drilling to occur through the guide, and the possibility of placing implants through the guide with vertical control. In all likelihood, however, it is only a matter of time before in-office 3D printing technology catches up. FIGURE 5. Advanced technology allows in-office printing of implant surgical guides. Most of the studies focusing on survival of implants placed using traditional or guided methods have not found great differences in the ultimate complication: implant failure.3,4,11,12 The majority of these studies were retrospective in design. However, in a prospective mono-center study,13 researchers reviewed 26 patients receiving 114 implants with 3D imaging guides and found the 1-year survival of the implants was 88.6%; when looking at smokers and nonsmokers, the survival rates were 69.2% and 98.7%, respectively. They concluded that smoking might be considered a contraindication to guided implant surgery. In this study, some of the implants were placed in edentulous or partially edentulous patients, and all of the implants were placed flapless. Some of the implants were immediately loaded, and these had a higher failure rate than devices that were not loaded immediately. Other studies,4,5 however, have not reported similar failure rates — neither with immediate loading, nor in heavy smokers. Further research is needed to explain these variations. The use of navigation is an emerging approach to implant placement. Also called robotic surgery, this involves the use of tracking devices attached to the patient and implant handpiece. These two positions in space are relayed to a central processing unit and superimposed on a monitor. Their relation to the previously planned implant osteotomy is displayed, and the implant handpiece can be adjusted by following the onscreen graphics. This eliminates the need for a surgical template, as traditionally used in image-guided surgery, and allows real-time correction during the drilling and insertion of the implant. While this technology is new and there is little information about its accuracy, the potential is massive. When the patient and implant site are straightforward — such as an upper second premolar site in a low-smile-line patient who has plenty of bone and attached gingiva — using an image-guided approach for a single implant does not offer a high return on investment. Image-guided surgery makes sense when there are challenges, such as anatomical limitations or if multiple implants are being placed in the same jaw. Using a 3D-image-guided approach can save time in the operating room, but it increases fees and possibly poses additional risks, as some studies have reported a lack of accuracy6,9 and higher complication rates7,10 (as discussed earlier in this article). It is important to note that image-guided implant surgery has developed significantly in the last 10 years and this explains the wide variation of outcomes in the literature. More outcome data on the various approaches to image-guided surgery are needed before its indications and contraindications are clear. This review of the evidence clearly supports the use of CBCT as a diagnostic aid to facilitate communication about surgical and restorative options and restrictions. The next level of using CBCT to guide the position of implants is more controversial, however, and there are conflicting reports in the literature. The use of guides in implant dentistry has evolved rapidly and has been promoted by the industry before there are reliable outcome data in terms of accuracy of placement and implant survival. While the positive studies outweigh the negative reports, this variation in outcomes is cause for concern. Further research is needed to improve this technology and explain the variation currently reported. In addition, there are relatively little data regarding partially guided versus fully guided surgery, or possible difference between laboratory-fabricated guides and in-office printed guides. Ultimately, while the literature supports the use of 3D image guidance when placing implants, it is critical to note this technique is not for the inexperienced. Although image-guided implant placement may appear easy, it can quickly become complicated and it takes an experienced implant surgeon to use these guides effectively. Clinicians can use cone beam computed tomography and specialized software to virtually place implants. The resulting imaging serves as an excellent planning and communication tool that reduces potential discrepancies between desired and actual implant positioning. Image-guided surgery makes sense in cases with anatomical limitations or if multiple implants are being placed in the same jaw. Today’s digital technologies allow the creation of surgical guides that help ensure accurate implant placement. 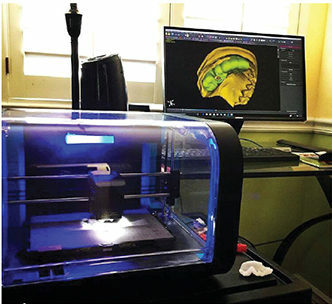 The increasing quality and availability of three-dimensional (3D) printers makes in-office printing of surgical guides a viable alternative to purchasing guides from laboratories. Although the literature supports the use of 3D image guidance when placing implants, it is critical to note this technique requires a high level of surgical experience. Jansen CE. CBCT technology for diagnosis and treatment planning: what general practitioners should consider. Compend Contin Educ Dent. 2014;35:749–753. van Steenberghe D, Glauser R, Blombäck U, et al. A computed tomographic scan-derived customized surgical template and fixed prosthesis for flapless surgery and immediate loading of implants in fully edentulous maxillae: a prospective multicenter study. Clin Implant Dent Relat Res. 2005;7 (Suppl 1):S111–S120. Merli M, Bernardelli F, Esposito M. Computer-guided flapless placement of immediately loaded dental implants in the edentulous maxilla: a pilot prospective case series. Eur J Oral Implantol. 2008;1:61–69. Orentlicher G, Horowitz A, Goldsmith D, Delgado-Ruiz R, Abboud M. Cumulative survival rate of implants placed “fully guided” using CT-guided surgery: a 7-year retrospective study. Compend Contin Educ Dent. 2014;35:590–598,600. Vasak C, Kohal RJ, Lettner S, Rohner D, Zechner W. Clinical and radiological evaluation of a template-guided (NobelGuide) treatment concept. Clin Oral Implants Res. September 18, 2012. Epub ahead of print. Komiyama A, Klinge B, Hultin M. Treatment outcome of immediately loaded implants installed in edentulous jaws following computer-assisted virtual treatment planning and flapless surgery. Clin Oral Implants Res. 2008;19:677–685. Ozan O, Turkyilmaz I, Ersoy AE, McGlumphy EA, Rosenstiel SF. Clinical accuracy of 3 different types of computed tomography-derived stereolithographic surgical guides in implant placement. J Oral Maxillofac Surg. 2009;67:394–401. Arisan V, Karabuda ZC, Ozdemir T. Accuracy of two stereolithographic guide systems for computer-aided implant placement: a computed tomography-based clinical comparative study. J Periodontol. 2010;81:43–51. Tahmaseb A, Wismeijer D, Coucke W, Derksen W. Computer technology applications in surgical implant dentistry: a systematic review. Int J Oral Maxillofac Implants. 2014;29 (Suppl):25–42. Behneke A, Burwinkel M, Behneke N. Factors influencing transfer accuracy of cone beam CT-derived template-based implant placement. Clin Oral Implants Res. 2012;23:416–423. Schneider D, Marquardt P, Zwahlen M, Jung RE. A systematic review on the accuracy and the clinical outcome of computer-guided template-based implant dentistry. Clin Oral Implants Res. 2009;20 (Suppl 4):73–86. Abboud M, Wahl G, Guirado JL, Orentlicher G. Application and success of two stereolithographic surgical guide systems for implant placement with immediate loading. Int J Oral Maxillofac Implants. 2012;27:634–643. D’haese J, Vervaeke S, Verbanck N, De Bruyn H. Clinical and radiographic outcome of implants placed using stereolithographic guided surgery: a prospective monocenter study. Int J Oral Maxillofac Implants. 2013;28:205–215. FEATURED IMAGE: The author (right) preparing for three-dimensional image-guided implant surgery using software enhanced cone beam computed tomography (seen on the monitor in the background). From Decisions in Dentistry. December 2017;3(12):11—15. Anders Nattestad, DDS, PhD, is a professor, director and interim cochair of oral and maxillofacial surgery at the Arthur A. Dugoni School of Dentistry, University of the Pacific in San Francisco. He can be reached at anattestad@pacific.edu.